The Browns are losing games and key players at an alarming rate. With Brandon Weeden sustaining a concussion in Sunday’s troubling 32-28 loss against Jacksonville, and Jason Campbell still not medically cleared to practice after suffering a head injury last week against Pittsburgh, Browns coach Rob Chudzinski began preparing for this week’s game at New England not knowing who he will start at quarterback against the powerful Patriots. Weeden played all four quarters – 75 snaps – against the Jaguars, and didn’t complain about any symptoms until afterward, when he was diagnosed with the concussion. Weeden was sent home Monday after reporting to the Browns’ training facility and is following the league’s protocol on head injuries. Chudzinski did not know ”exactly” when Weeden got hurt, but said it’s not unusual for players to not feel well until after the game. Campbell has been cleared to resume football activities, but still can’t practice. If he’s not on the field Wednesday, the Browns (4-8) may have to start Alex Tanney, who was signed last week off Dallas’ practice squad. He’s best known for a YouTube trick-shot video he made at Division III Monmouth (Ill.) College and has not played a single down in a regular-season NFL game. Chudzinski said it’s also possible the Browns will sign a free-agent quarterback. 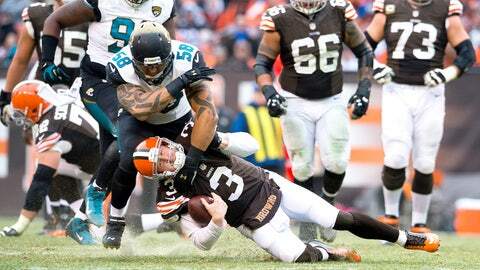 Tanney was given a small package of plays last week so he would be ready in case he had to play against the Jaguars. Ideally for the Browns, Campbell will be ready, but the way their luck has gone lately, they’re preparing for the worst. Chudzinski said it’s possible the Browns’ coaching staff may have to prepare several game plans for Sunday, one tailored to the strengths of whoever is behind center. Their quarterback conundrum comes at sensitive time for the Browns (4-8), who are reeling after blowing a lead in the final four minutes and losing to the Jaguars. Once at 3-2, Cleveland has dropped six of seven and had a season filled with optimism slide toward another filled with failure. Still, Chudzinski tried to spin some optimism into an otherwise dreary situation. Chudzinski defended his decision to stay aggressive late in the first half, when Weeden threw two interceptions and fumbled in the final 2:35 as the Jaguars scored 13 quick points to turn a 14-7 deficit into a 20-14 halftime lead. Looking back was again tough for star cornerback Joe Haden, who bit on a move by Jaguars wide receiver Cecil Shorts and gave up the game-winning TD pass with 40 seconds left. Following Sunday’s loss, an emotional Haden choked back tears and his voice quivered while discussing the pain of losing. Haden said Monday that he didn’t regret his comments and won’t tolerate losing.